To make the unlock process easier, the Mobile Device Unlock app had been pre-installed by two major carriers in the US, T- Mobile and MetroPCS. Through this app, we are now able to remotely register any IMEI as “Eligible” in your carrier’s database without the need for an unlock code. However, this only works on compatible devices, please visit list at the bottom. Good news! Turn around is less than 2 business days! You need not visit any T-Mobile or MetroPCS store to get your device unlocked. The Mobile Device Unlock app allows an unlock request right where you are at the moment. 1. 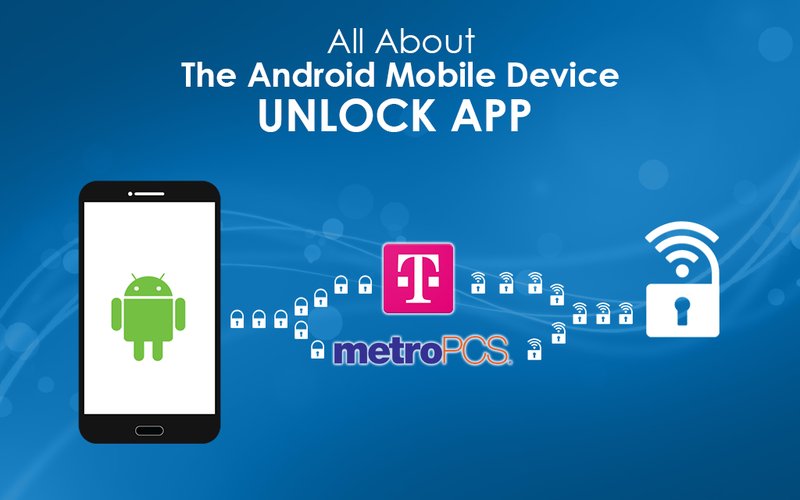 The Mobile Device Unlock app works only with MetroPCS and T-Mobile devices. Any device from another carrier will not unlock using this process. 2. Make sure your phone is “clean”; not blacklisted nor reported as lost or stolen. We don’t have any blacklist “cleaning” service and there’s no refund if your phone is blacklisted. 4. If you are getting a different error, please check troubleshooting steps before you order any unlock from us. We will not be able to fulfill any unlock request unless your other phone issues are fixed. 5. Make sure you are ordering the right unlock service for your phone/device, choose your carrier correctly. 6. Make sure your phone can communicate with “Device Unlock App” server BEFORE you make any unlock order from us. If you are getting a “Serving not responding, please try again later” error, it means that your phone isn’t communicating with your carrier’s server. Check troubleshooting steps for more. 7. Make sure your phone is with its original software and IMEI. If you installed a custom software prior to your unlock order, it will not be possible for the app to work. Also, make sure that your phone has the latest software. There’s no refund for unsupported software fault. 8. Before starting the unlock process on your mobile phone, make sure that you have an active 3G/ 4G/ LTE or wifi connection. If your internet connection isn’t reliable, there’s a possibility that the unlock will be unsuccessful. We can’t retract the process, so we need to do it right the first time. There’s no refund for an unreliable internet or data fault. 9. Once you receive an email notification from us, make sure you follow all the necessary instructions or order prerequisites, take note that it varies per carrier, but we always ask everyone to try to unlock their device using the app before proceeding with their order. This way we will know the exact error that you are getting for us to know whether your device can be unlocked with us. 10. If in case, you have not followed all the instructions or have withheld important information from us that caused the unlock process to be unsuccessful, we will be unable to provide any refund. 11. Make sure your device memory is managed properly, and clear all cache. 12. Always restart your device after the unlock process. You’ll have to see a pop up every now and then. Budget versions of higher priced phones are proving incredibly popular with many phone fans willing to sacrifice a little less performance for a significantly lower price. With this in mind, Samsung has released the budget minded Galaxy J3 Prime, and while you have to accept it’s not going to be top of the range, it’s certainly a lot of phone for the money. This Samsung Galaxy J3 Prime was launched just last month, April 2017, and comes with a 5.00-inch HD touchscreen display with a resolution of 720 pixels by 1280 pixels. An ideal economy choice, the phone measures 139.70 x 69.85 x 8.89 (height x width x thickness) and weighs 148.00 grams. The Galaxy J3 Prime is powered by a 1.4GHz quad-core Exynos 7570 processor and it comes with 1.5GB of RAM. It also has a removable battery, which can be extremely useful in the event the phone stalls or the battery needs replacing. It runs the latest version of Android, Android 7.0 (Nougat), and has 16GB of internal storage that can be expanded up to 128GB via a microSD card. As for cameras, the Samsung Galaxy J3 Prime has a 5-megapixel primary camera on the rear and a 2-megapixel selfie shooter on the front. The streamlined layout of Easy Mode enables you to find everything quickly and, as the name suggests, easily. The Samsung Galaxy J3 Prime is a single SIM (GSM). Connectivity options include Wi-Fi, GPS, Bluetooth, 3G and 4G. Sensors on the phone include Proximity sensor, Accelerometer and an Ambient light sensor. Samsung describes the phone as doing everything you love and yet it still fits your pocket. That’s because it’s slightly smaller than the 5.5-inch screen phones, and, of course, is set a budget price. 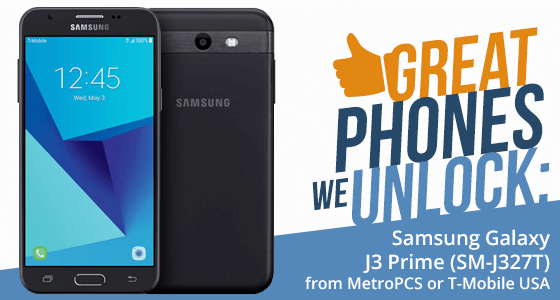 MetroPCS offers a highly competitive walk-in, cash down offer for the Galaxy Prime J3 at a one-off purchase price of just $69.00. T-Mobile offers the phone for $150, along with a package that includes a SIM Starter kit $10 and a $50 Prepaid Refill Card, these extras boost the package to $210. The J3’s size, capability and low cost could make it the perfect travel phone. If you prefer another service provider or you have found a better SIM deal, UnlockBase can instantly and economically unlock your Samsung Galaxy J3 Prime for you with the “Device Unlock” APP an Android app that allows you to request and apply a mobile device unlock directly from the device. This allows you to automatically apply Mobile Device Unlock to the device without using a manual code. When your phone is locked with “Device Unlock” APP it’s totally useless to order an unlock code. Unlockbase is the longest establish and the web’s largest online remote cellphone unlock service. We stand ready and able to unlock the widest database of cellphones from a vast list of global service providers, 24/7. The LG K20 Plus is now available at both T-Mobile (LG TP260) and MetroPCS (LG MP260). 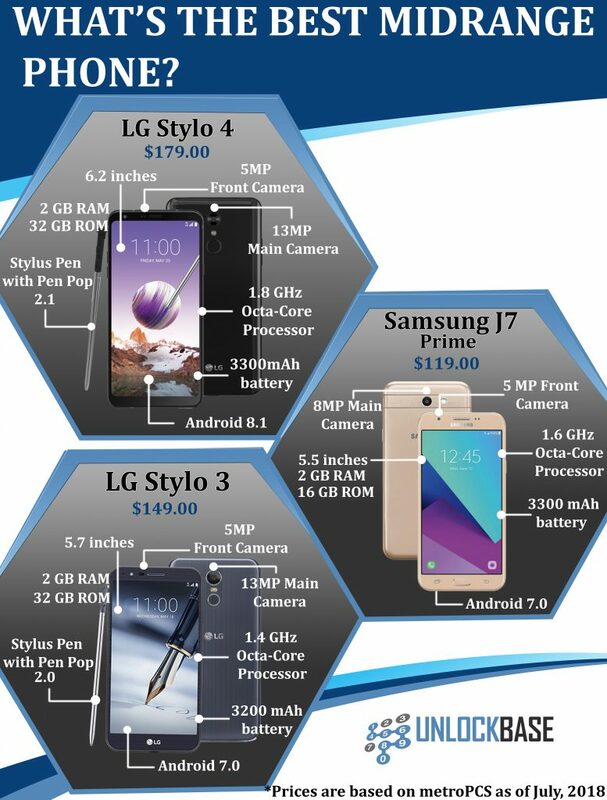 The new budget priced smartphone provides LG fans with a cheaper alternative if the G6 is beyond their means. T-Mobile offers the phone for $31.99 down and $7 per month for 24 months, or $199.99 outright. 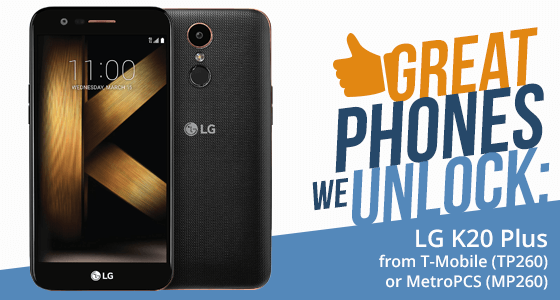 Or the LG K20 Plus can be snapped up at MetroPCS for just $119.00 A great deal for those seeking a new smartphone that runs the latest version of Android. LG K20 Plus ships with Android 7.0 Nougat right out of the box. The smartphone sports a 5.3-inch display with HD (720p) resolution and a 13-megapixel camera on the back. The phone also features a 2.5 Arc Glass Design with skillfully curved edges, and a slim and light design in a metallic frame enhanced with the latest fingerprint print sensor security. This new phone is part of LG’s mid-range and comes complete with a quad-core Qualcomm Snapdragon 425 processor, 2GB RAM, and 32GB expandable storage. The K20 Plus comes with a secondary 5-megapixel selfie camera with selfie light and a rear-mounted fingerprint reader as well. Usefully, the LG K20 Plus comes with a removable 2,700 mAh battery, bucking the trend for batteries that are integrated into the phone therefore non-replaceable in the event of a problem. The device weighs a mere 142 grams, and measures 149mm in length, 75mm in width and 7.9mm in thickness. Overall, the LG K20 Plus is a capable, on trend smartphone for the price, and should fare well in the increasingly competitive mid-range segment. With global annual sales in excess of USD 55.91 billion, LG comprises four business units: Home Entertainment, Mobile Communications, Home Appliance & Air Solution, and Vehicle Components. It’s one of the world’s leading producers of mobile devices, as well as electrical goods including TV’s, air conditioners, washing machines and refrigerators. Can you get out of a tiresome or poor value 24-month contract for the LG K20 Plus? That’s what Unlockbase is here for. UnlockBase can instantly and economically unlock your LG K20 Plus for you with the “Device Unlock” APP an Android app that allows you to request and apply a mobile device unlock directly from the device. This allows you to automatically apply Mobile Device Unlock to the device without using a manual code. When your phone is locked with “Device Unlock” APP it’s totally useless to order an unlock code. Unlockbase is the web’s largest online remote cellphone unlock service, able to unlock the widest database of cellphones from service providers the world over, 24/7. Imagine a phone with a whole world inside it. It opens when it sees your face, learns from you and erases barriers between you and the world on an expansive, beautiful Infinity Screen. The new Samsung Galaxy S8 (SM-G950T) and S8 Plus (SM-G955T) brings with it a raft of cutting edge new ideas and features designed to help you live life the way you want to live it. The Galaxy S8 expansive display stretches from edge to edge, giving you the most amount of screen in the least amount of space. The Samsung Galaxy S8 Plus is the bigger brother of the Samsung Galaxy S8. The S8 is a 5.8-inch phone while the S8 Plus is a sizeable 6.2 inches. They both feature a new design in which the “infinity display” wraps around the device, meaning that the large screen takes up almost all the front of the phone. The new larger screen is a real turning point in flagship phone design and should usher in the end of large bezels, and the camera and slick performance work brilliantly at fingertip control. These new models may command a premium price, but make no mistake: they are truly premium phones. The screen is the clearest, sharpest offering from Samsung yet and delivers superior color reproduction to make movie watching a near cinematic experience. When you press the new Bixby button to access the Bixby Home screen, it learns from your routine to serve up the right apps and content at the right time, and makes it easy to ask Bixby a question or make a command. You can use Bixby, Samsung’s new intelligent interface for all sorts of daily needs including as a reminder to keep track of your to-do list, to pick up milk on the way home, or even keep track of your place in an article online. For enhanced security, both the Samsung Galaxy S8 and S8 Plus are equipped with the latest in iris scanning and face recognition for unlocking your phone right away. There’s also defense-grade security that stands guard around the clock. As for one of the most popular devices of all on any Samsung Galaxy, the 12MP Dual Pixel Rear Camera still takes amazing photos in low light, but now comes with an enhanced 8MP front-facing camera so you can take even better, clearer selfies. Then there is Bixby Vision. It’s built into your camera to give you a deeper understanding of what you’re looking at. For example, you can focus on an object through your viewfinder, tap the Bixby Vision icon, and instantly launch into an intelligent mode to identify landmarks or translate foreign languages just by pointing the camera at the message you want to interpret. Or you can take a picture of an item you want to buy, and find the best place to buy it. In addition to all this, the new Samsung S8 and S8 Plus keeps track of every area of your daily activity. Samsung Health enables you to monitor everything from your steps each day to sleep to nutrition, live chat with a doctor and stay motivated with notifications. Samsung Pay lets you carry all your cards on your devices so you can pay in-person or in-app. Plus get extra rewards for the same purchases you make every day. Samsung Connect lets you control hundreds of devices and appliances, whether you’re at home or out and about. 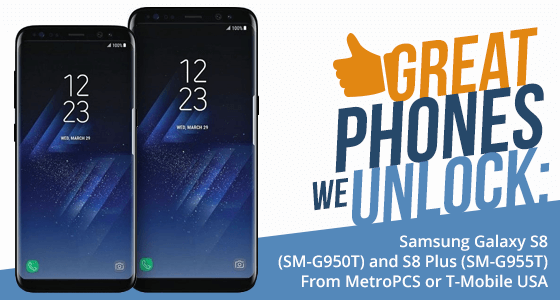 The Samsung Galaxy S8 is available at MetroPCS for $729 or for $750 from T-Mobile, T-Mobile also offers monthly contract terms of $30 per month over 24 months. The Samsung Galaxy S8 Plus from MetroPCS is $835 and $850 from T-Mobile, T-Mobile also offers monthly contract terms of $130 down plus $30 per month over 24 months. If you don’t want to be tied down to a contract, UnlockBase can instantly and economically unlock your Samsung 8 or 8 Plus for you with the “Device Unlock” App an Android app that allows you to request and apply a mobile device unlock directly from the device. This allows you to automatically apply Mobile Device Unlock to the device without using a manual code. When your phone is locked with “Mobile Device Unlock” it’s totally useless to order an unlock code. ZTE is the fourth largest smartphone supplier in the U.S. and the second largest in the no-contract market. This month they announced the availability of the next generation of the ZMAX series, the ZMAX PRO. 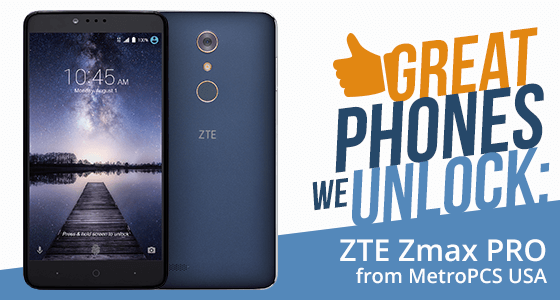 It’s available through MetroPCS for the affordable price of $99.00 after instant rebate. The ZMAX PRO breaks new ground as it is the first US carrier supported phone under $100 that features a fingerprint sensor, and a 3400 mAh battery. But seriously, a $99 smartphone? How good can it be? A monster 6” Full HD LCD Display with resolution of 1920 x 1080. 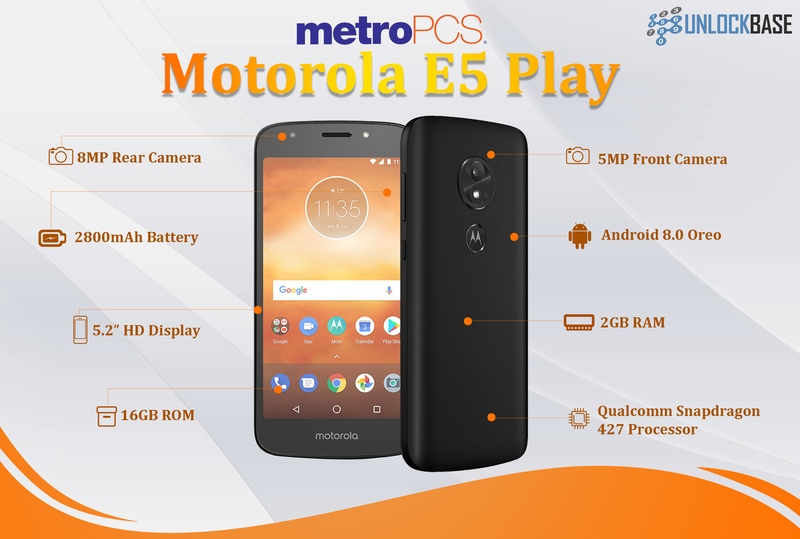 MetroPCS has also added its own app store offering Metro PCS apps that come pre-installed on the device along with a variety of utilities and games, although in reality this is little more than a link to the Android app store. The ZTE ZMAX PRO also features a USB Type-C connector. The cameras have the ability to frame, shoot and edit pictures on the go. Power hungry video games are playable without pause or problems, although some apps can take a little longer to load. Unusually, the ZTE ZMAX PRO also includes a Qualcomm® Quick Charge 1.0 enabling you to charge the phone up to 40% faster than older phones. In terms of styling and comfort, although it’s a lot of phone, it’s comfortable to hold in the hand. The soft touch back features the fingerprint sensor, which is fast and accurate. It can also be used to quick launch apps based on the finger that you use and you can also answer phone calls just by pressing the sensor. The original retail price of the phone is $179.99 but Metro PCS’ mail-in rebate offer whittles it down to just under the $100 price mark which makes this phone an exceptionally good deal. The Coolpad Group Limited is a Chinese telecommunications equipment company headquartered in Shenzhen, Guangdong, China. It’s the largest smartphone company in terms of sales in the domestic market. With 6 R&D facilities worldwide, the company continues to invest heavily in developing innovative cellular, wireless, and mobile technology products. Producing and launching over 85 different models and 50 million handsets a year. Released in June of this year, the Coolpad Catalyst 3622A is the fourth phone from Catalyst to reach the US market. 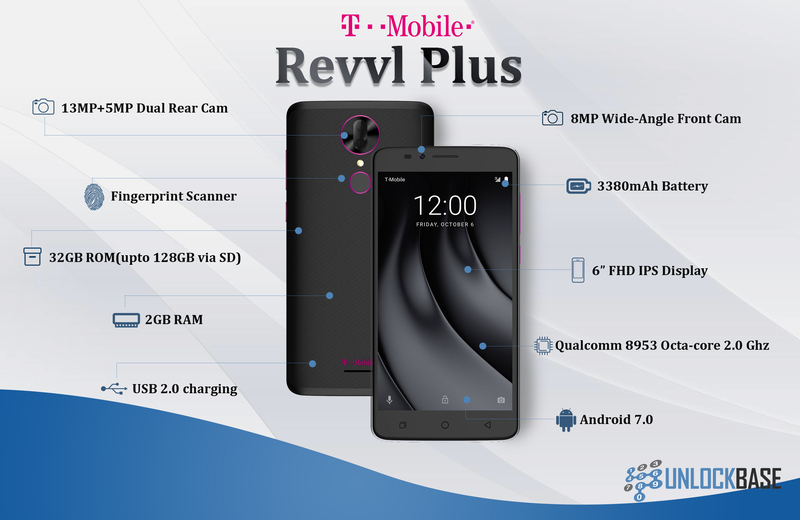 It’s a budget, 5” 4G LTE smartphone packed with many of the features of higher cost smartphones, including full built-in video calling, Android 5.1 Lollipop operating system, and a fast quad core processor for keeping in touch with friends and family and entertaining oneself on the go. The cameras are adequate for everyday use and include a 5mp main camera with LED Flash as well as a 2mp front facing camera. The phone comes with a 2200mAh battery. 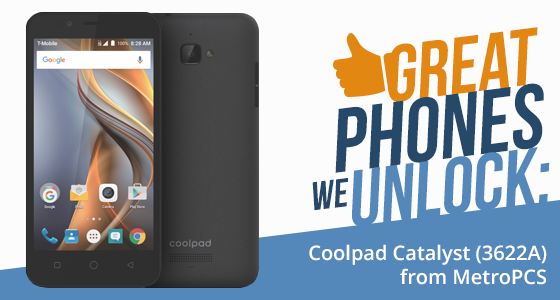 MetroPCS offers the Coolpad Catalyst with up to 80% off the retail price, meaning that after the mail-in rebate the phone could be in your hands for as little as $19.00. Not surprisingly, it’s one of the lowest cost phones in their portfolio. While the Coolpad Catalyst is well equipped, and has 4G LTE connectivity, most of its features reflect its low budget price including the 480 x 854 pixels screen resolution, one of the lowest screen resolutions currently available. RAM memory is also only 1 GB and the low pixel cameras mean photographs could turn out looking grainy. In terms of looks and aesthetics, for the price you definitely are not going to get a Samsung Galaxy S7, but the phone adopts a curved handheld shape. The front is glass and the glass is contained within a plastic frame. The rear shell, also plastic, wraps around to meet the frame. The display takes on a bright gray hue when off and it stands out starkly from the pitch black bezel. Overall, a reasonable, low cost, big screen entry level solution with above average call and sound quality. Designed for the smartphone newbie, or those that don’t expect or demand too much from their phone. At this level of pricing you will want to find the best sim only deal you can. If you want to unlock your Catalyst Coolpad from MetroPCS, UnlockBase can do it for you, quickly, easily and economically. We can quickly, efficiently and economically unlock your Catalyst Coolpad 3622A using the Device Unlock App. Samsung has skipped Samsung Galaxy Note 6 and gone straight to Galaxy Note 7. It’s described as their kitchen sink phone, as contained within its sleek casing is it comes with everything you could possibly need. It comes with a cool almost bezel-less wraparound 5.7” QHD super screen made of scratchproof Corning Gorilla Glass, and strikes a balance between work and play, enabling users to achieve more than what they thought possible on a smartphone. The phone comes with 64GB of internal memory upgradeable to 256GB. The S Pen: With its new 0.7mm smudge-proof silicon tip everything you write, draw, and edit is sharp and to the point. The S Pen also gives users the ability to easily create and share GIF animations with Smart Select, and new Air Command functions, including Magnify and Translate enable users to zoom in on the screen or convert languages by simply hovering. Water repellant: The Galaxy Note 7 repels splashes and dust, and protects against accidental dips in the water of up to five feet for 30 minutes. You can even write when it’s wet with the S Pen. Iris Scanner Security: The new iris scanner means you can keep your most valued items and notes secure with superior protection which is unique to you. With the Galaxy Note 7’s advanced biometric authentication you can opt for fingerprint scanner and iris scanning technology. You can also interchange security options depending on how you use your phone. Taking secure purchasing to another level, the iris recognition technology can also be used to authenticate purchases with Samsung Pay. Cutting edge cameras: The Galaxy Note 7 has a 12MP 2PD Rear-Facing Camera and a 5MP 2PD Front-Facing Camera which are capable of taking pictures even in dull conditions as they have faster autofocus and a lens that lets in 95% of available light. First class entertainment: In addition to the ability to stream HD video in cinema like perspective, by pairing the Galaxy Note 7 with the new Gear VR powered by Oculus, users can experience premium virtual reality almost anywhere. Galaxy Note 7’s Super AMOLED screen and powerful processor delivers a library of apps, photos, games and more to put users at the center of the action. Not surprisingly, armed with its handsome new looks, superior functionality and security, it is Samsung’s most expensive phone retailing through T-Mobile at $849.99 if you were to walk in and buy it off the shelf. But if you were to go on contract it can be yours for just $69.99 upfront and $32.50 a month for 24 months. In addition to the phone T-Mobile also tempt you with the choice of a full year of Netflix, a Samsung Gear Fit2, or a 256GB memory card. 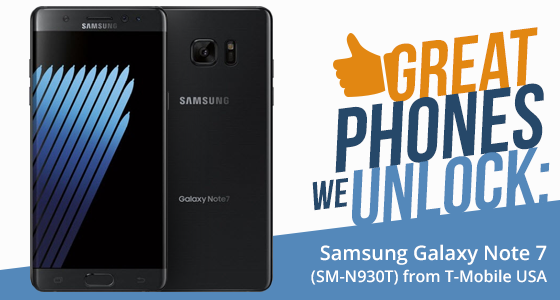 The Galaxy Note 7 is Samsung’s top of the line phone, so it makes sense to find the best phone deal to enjoy it. UnlockBase is the web’s leading remote unlock service with the largest database of phones and service providers from around the world. Even though the Galaxy Note 7 was only launched this month we can still unlock for it you with Device Unlock. It’s an Android app that allows you to request and apply a mobile device unlock directly from the device. This allows you to automatically apply Mobile Device Unlock to the device without using a manual code. Please note that when your phone is locked with “Mobile Device Unlock” it’s totally useless to order an unlock code.